After donating 99 AEDs throughout 2012, AED.com is holding a Facebook Video Contest for their last Automated External Defibrillator (AED) donation. 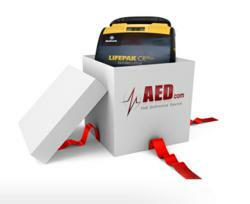 With only a few days left in 2012, AED.com is one AED away from donating 100 AEDs (automated external defibrillators) this year. At the beginning of 2012, president and CEO, Matt Spencer, decided to donate 100 AEDs to deserving individuals, causes, and organizations in order to raise awareness. "The goal was to raise awareness for the need of AEDs anywhere and everywhere Sudden Cardiac Arrest can potentially strike," said Justin Darby, Marketing Director for AED.com. Cardiac Arrest, which strikes more than 383,000 people in the U.S. annually, is the number one cause of death, but there are measures that can be taken in order to prevent it. "The lay rescuer should be able to grab an AED within seconds of a victim collapsing from Sudden Cardiac Arrest. For every minute that passes without therapy from a defibrillator, the victim's chances of survival decrease by 10 percent. After five minutes in cardiac arrest without rescuer assistance, brain damage is likely to occur and there is a very low chance that the victim will survive," commented Darby. From churches and schools, to athletic fields and foundations, AED.com donated 99 AEDs throughout the year. AED.com's final donation is part of a video contest and that takes place on the AED.com Facebook Page. Contestants are asked to submit a 1 to 3 minute video telling who they would donate an AED to in their name. "This is a fan-voted contest and we want contestants to get creative with their video," remarked Darby. The video with the most votes will be awarded a new AED and wall cabinet valued at over $1,700 on January 7th, 2013, and this will be the 100th AED donation from AED.com. "We are proud to complete this amazing project and give the gift of safety and peace of mind, but more than anything we are proud to potentially give someone the opportunity of extending a life, potentially even their own," commented Darby. By spreading awareness and helping place AEDs in public places, AED.com is contributing in reducing the time it takes to use an AED on a victim of Sudden Cardiac Arrest, and increasing the chances of survival in many public areas. 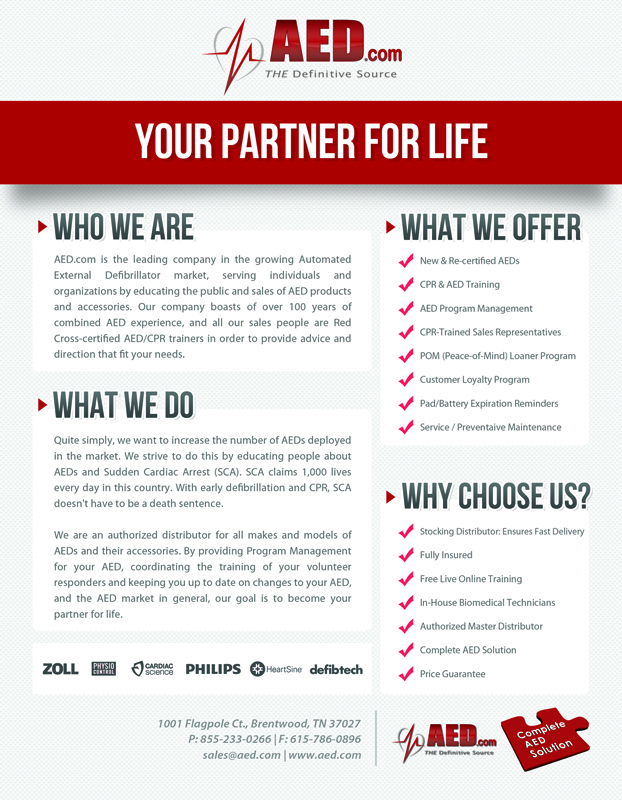 AED.com serves more than 20,000 customers in all 50 States and 35 countries worldwide. For more information about AED.com, please visit: http://www.aed.com/.